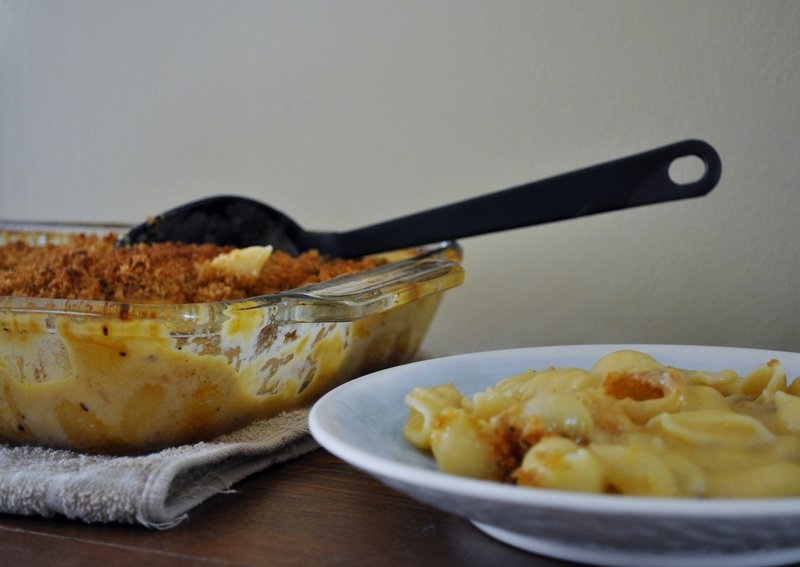 There aren’t too many mac and cheese recipes that I try and actually love. I keep searching ad trying new recipes hoping that one day I will find the perfect version. When I saw this Cook’s Illustrated version I figured it was worth a shot since they never let me down. I was pleased with this version and would definitely make it again. It’s makes a very large batch and I think next time I would bake in two smaller pans and freeze one for a quick weeknight meal. Stir the drained pasta into the cheese sauce, breaking up any clumps, until well combined. Pour into a lightly greased 9×13 inch baking dish and sprinkle with crumb topping. This recipe has been floating around all over the blogosphere and for good reason – it’s really tasty! This dish is supposed to be a spin off of its pre-packaged counterpart hamburger helper. 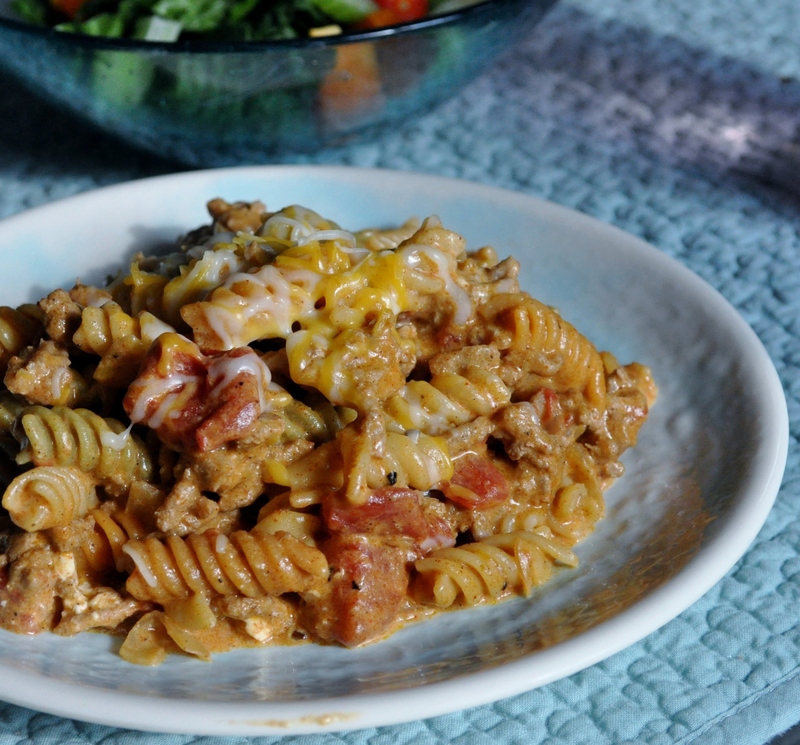 I’ve never had the hamburger helper version so I can’t compare, but this version is so good that I’d be willing to bet it blows the other out of the water. Homemade vs. store bought? I don’t even think there can be a comparison. This is also a great week night meal! Bring a large pot of water to boil. Cook pasta according to the package directions. Drain, reserving ½ cup of pasta water. Set aside. Meanwhile, in a large skillet or sauté pan, cook the ground turkey over medium-high heat until no longer pink. A few minutes before the turkey is cooked through, add the chopped onion to the skillet. Once the turkey is cooked through, mix in the garlic and cook until fragrant, about 30 seconds. Mix in the diced tomatoes and taco seasoning and let simmer over medium heat for about 5 minutes. Stir in the cooked pasta, cream cheese, sour cream and reserved pasta water, and continue stirring until the cream cheese is melted and the sauce is well blended. Season with salt and pepper to taste. Simmer over medium-low heat 3-5 minutes to reduce the sauce a bit. Remove from the heat and top with shredded cheddar cheese, if desired. Why is it when flipping through cookbooks there are certain recipes that just get overlooked for one reason or another? This was definitely the case for this recipe and I’m not sure why. I have flipped through Ina’s Back To Basics book countless times and I can’t say this recipe ever really stood out to me. Maybe because there are so many other wonderful recipes waiting to be tried? Whatever the reason, I’m glad this one finally caught my eye. I knew that this would be a definite winner in my book, but I wasn’t sure about my meat-loving husband. I was pleasantly surprised when he couldn’t stop raving about this risotto and immediately asked if he could take the leftovers for lunch the next day. This will be making more appearances in our home! On another note, this was my first time cooking risotto with homemade chicken stock. I have been making a lot of it lately and have stockpiles in the freezer (recipe to come soon!). I really think it made a more flavorful risotto (and it saves money too!). In a medium saucepan, heat the chicken broth or stock over medium heat until simmering. Reduce the heat to medium-low, keeping the stock warm. Heat the olive oil and butter in a large sauté pan over medium heat until the butter is melted. Add the onions or shallots and leeks to the pan and sauté for 5-7 minutes, until tender. Add the rice to the pan and stir to coat well with the oil and butter, cooking for about 1 minute. Add the white wine and simmer over medium-low heat, stirring constantly, until most of the wine has been absorbed. Add the chicken stock, 2 ladles at a time, stirring almost constantly and waiting for the stock to be absorbed before adding more. 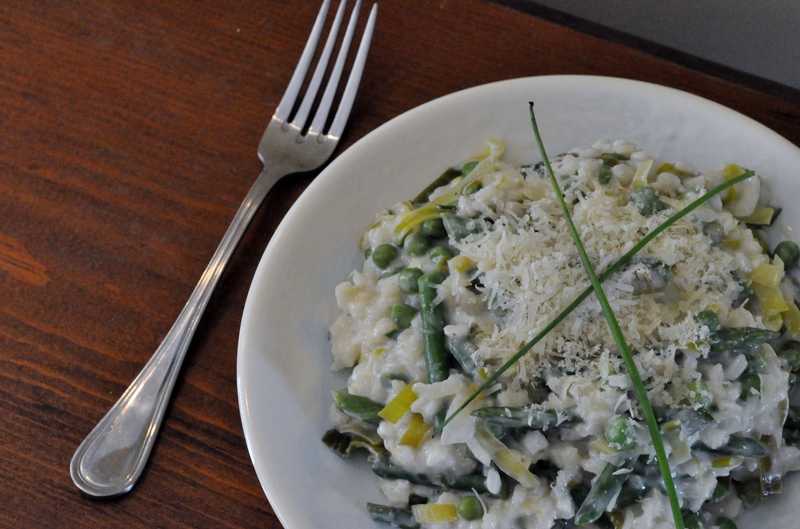 When the risotto has been cooking for 15 minutes, add the asparagus and peas to the risotto. Stir in the lemon zest, salt and pepper. Continue cooking and adding stock, stirring almost constantly, until the rice is tender but still firm. The entire process should take about 25-30 minutes. When the risotto is done, remove the pan from the heat. Mix in the lemon juice, mascarpone, Parmesan and chives. Stir until the cheeses are melted in and the risotto is creamy. Serve immediately with additional Parmesan, if desired. One evening, I was sitting at home alone with the baby when the chocolate urge struck. The baby was already in her jammies and I didn’t want to drag her out of the house so I found myself searching through recipes that would satisfy. Brownies seemed like an obvious choice and since I hadn’t tried a new variation in quite some time I decided to give it a go. I must say, at first bite I wasn’t overly impressed with these brownies. I was expecting a chewy, fudgy brownie and it just wasn’t so. I was so disappointed I almost threw the whole pan in the garbage. Good thing I didn’t though, because after these brownies sat overnight they turned into just that. 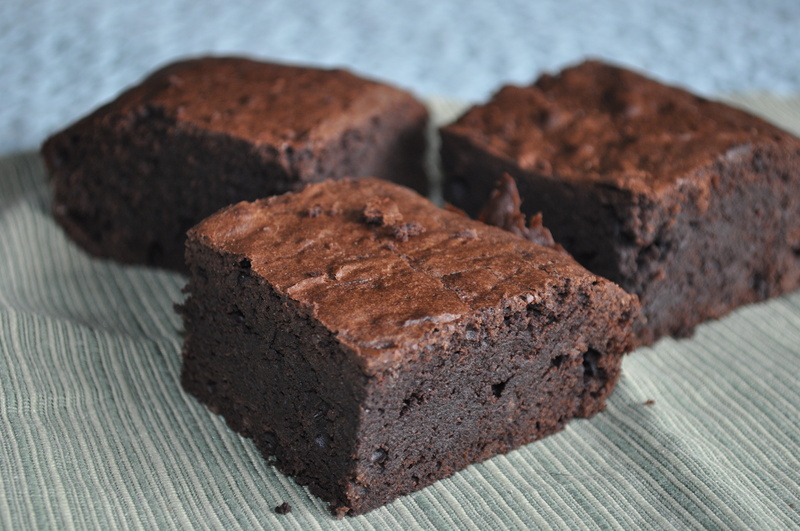 A perfectly chewy, fudgy, delicious brownie. These were a real treat and I’m glad I gave them a second chance. Place an oven rack in lower-middle position and preheat the oven to 350° F. Line an 8-inch square baking dish with foil and spray lightly with nonstick cooking spray; set aside. In a medium bowl, combine the eggs, sugar, vanilla and salt; whisk until combined, about 15 seconds. Whisk in the warm chocolate mixture until incorporated. Then stir in the flour with a wooden spoon until just combined. 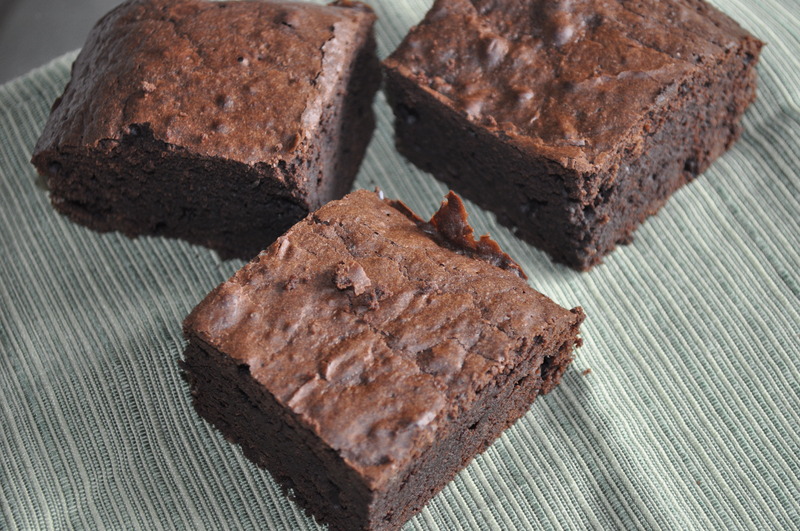 (It took me a while to get the flour evenly incorporated and I was worried it would affect the texture of the brownies, but they turned out fabulously – no need to worry.) Pour the mixture into the prepared pan and spread with a spatula to make an even layer. Bake until slightly puffed and a toothpick inserted in the center comes out with a small amount of sticky crumbs clinging to it, 35-40 minutes. Transfer the pan to a wire rack and let cool to room temperature, about 2 hours. Remove the brownies from the pan using the foil and transfer to a cutting board. Cut into squares as desired. Store in an air-tight container. I’m a Mom, wife, and a busy grad student. Some days that doesn’t leave much time for cooking. One of my priorities is that I put a nice meal on the table for my family every night. But, some days I just don’t have a lot of time or I don’t want to dirty every pot and pan in my kitchen while making our dinner. This is where this casserole comes in. It’s a one-dish meal that is quick, easy, and has excellent flavor. We all loved this meal and I believe Joe kept raving about how delicious it was. This meal will definitelybe enjoyed over and over in our home. Pat the chicken breast halves dry and season with salt and pepper. Heat 1 tablespoon of the vegetable oil in a 10-12 inch oven-safe skillet over medium-high heat. Add the chicken to the pan and cook until golden brown on both sides (chicken does not need to be fully cooked at this point.) Transfer to a plate and set aside. Add the remaining oil, shallot, garlic, chipotle, and ¼ teaspoon of salt. Cook just until fragrant, about 30 seconds. Add the chicken broth, scrape the browned bits from the bottom of the pan, and bring to a simmer. Stir in half of the tortilla chips. Nestle the chicken into the broth and cook over medium-low heat until cooked through (reading 160° F on an instant-read thermometer), about 10 minutes. Transfer the cooked chicken pieces to a cutting board and shred into bite-sized pieces when it is cool enough to handle. 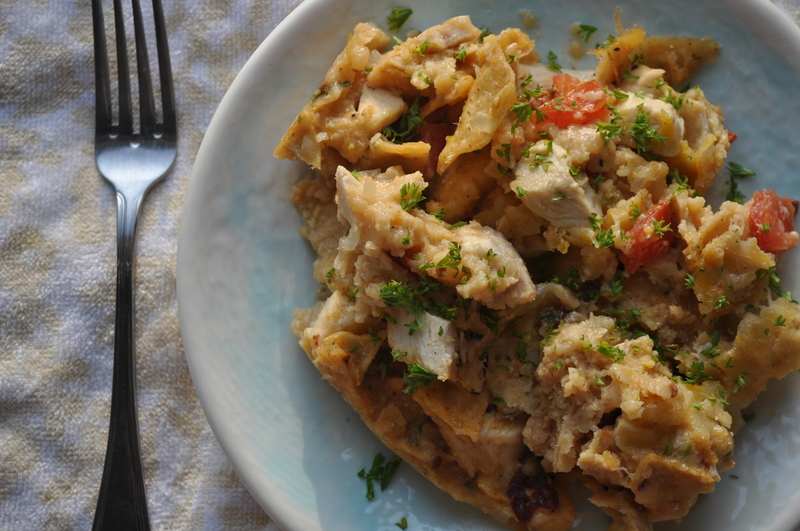 Return the shredded chicken to the skillet with the tomatoes, ½ cup of the shredded cheddar cheese, and 1 tablespoon of the cilantro. Stir in the other half of the tortilla chips until they are incorporated and moistened. Say hello to the most delicious pancakes ever. I realize this is a strong statement, but it is the truth. The pancakes themselves are perfectly fluffy and with the addition of cinnamon and maple glaze puts these pancakes over the top. The first time I made these my supposed pancake-hating husband devoured them. I constantly crave these pancakes, but due to the butter content, I reserve them for a once in awhile treat. In a medium bowl, combine the flour, sugar, salt, baking powder, and cinnamon. Whisk to combine. In a separate bowl, beat together the eggs, milk, corn syrup, butter, and vanilla. Stir flour mixture into the egg mixture. Heat a lightly greased griddle over medium/low heat. Pour about a 1/4 cup of batter onto the griddle. Brown on both sides. To make the icing whisk together the powdered sugar, butter, salt, maple syrup, and milk until combined. 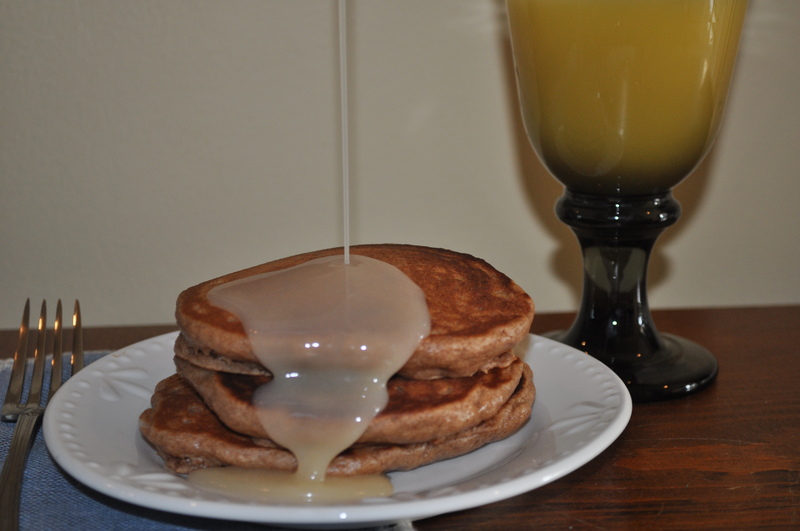 Serve pancakes warm with icing drizzled on top. *I have tried making the glaze with fat-free milk and the consistency and texture is not the same. I recommend using whole milk for this recipe. 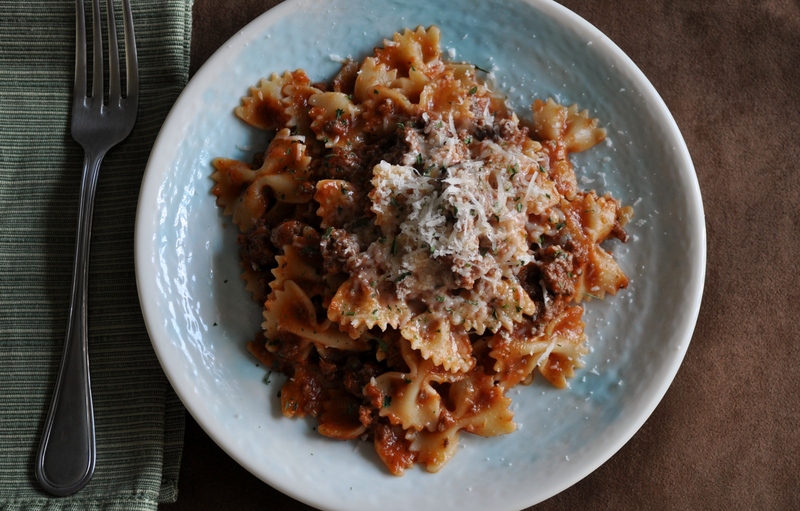 One of my favorite meals growing up was pasta with meat sauce. My Mom would make it for me quite often and it was always a treat. I still enjoy that now, but am always looking for new variations. I absolutely love this recipe because it is quick and delicious. I was actually quite surprised by how flavorful it really was. Bonus – only 2 pots are dirtied! It definitely satisfies that pasta craving and tastes like it took a lot longer to make.